For a respectable tomato salsa, fresh chiles are essential. Choose the finger-size serrano chiles for their citrusy notes, although jalapeño chiles make excellent tomato salsa too. For milder tastes, scrape out and discard the seeds and veins. For a bit more heat, include the seeds and veins. 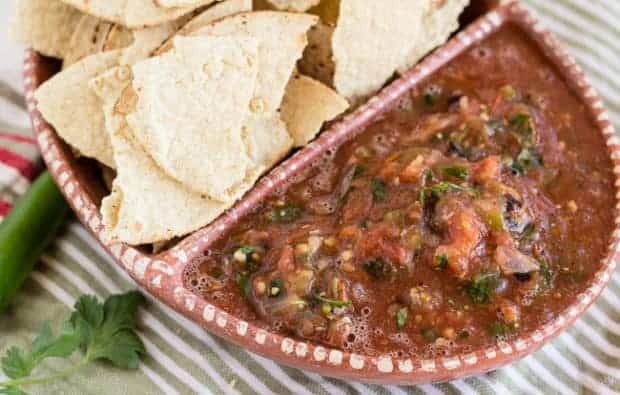 Using canned tomatoes, this chunky salsa comes together in 10 minutes! 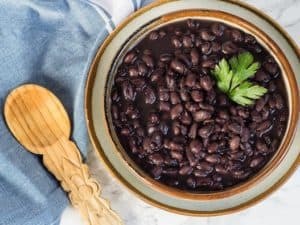 You can use regular or fire-roasted, diced or crushed, your choice. If using fresh tomatoes, roast them on the grill first. 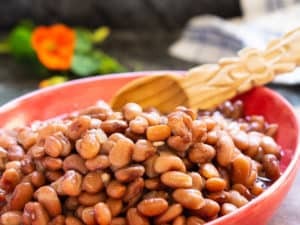 The skin easily slips off after roasting. Since the grill is already hot, why not give the chiles a char as well? There’s no need to peel the skins off the small charred chiles. 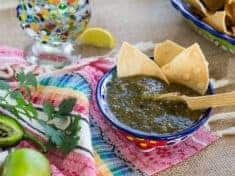 This go-to homemade Mexican salsa is infinitely more flavorful, more vibrant, and much classier than store-bought salsa! Make yourself proud. 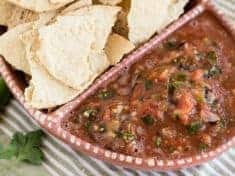 Dress up your chips and dip with homemade salsa. Of course you’ll want to serve your homemade Mexican tomato salsa with more than chips. Make it to go with your favorite breakfast eggs, or potato nachos, or colorful tacos. Taste the love. Savor the difference. Eat your heart out Herdez. LOL: People like to say salsa. 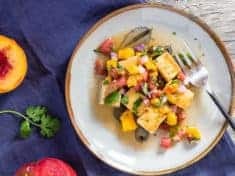 Have a fabulous week–get in the kitchen make your own awesome Mexican tomato salsa! Bring on the chips! Make this spicy fresh five-ingredient salsa in your food processor or blender. To keep it chunky, use the pulse button. Makes about 1 ¾ cups salsa. Servings: 1 to 2 cups. When the garlic pieces no longer hit the side of the work bowl, stop. Add the fresh or canned tomatoes, chiles, onion, salt, and cilantro. Pulse the on/off button for about 10 seconds. 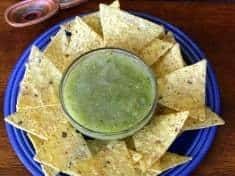 Do not over blend-- you want your salsa chunky! Replace the canned tomatoes with 3 large grill-roasted fresh tomatoes. Depending on your picante heat preference/tolerance, use one or two chiles and choose whether to keep or remove the seeds and veins. No processor? Alternatively, make this salsa in a blender. Coarsely chop the garlic first and throw it in the blender with the rest of the ingredients. Pulse the blender on and off. You may have to scrape down the side once. Do not over blend—keep it chunky! Leftover homemade salsa? Not a chance. 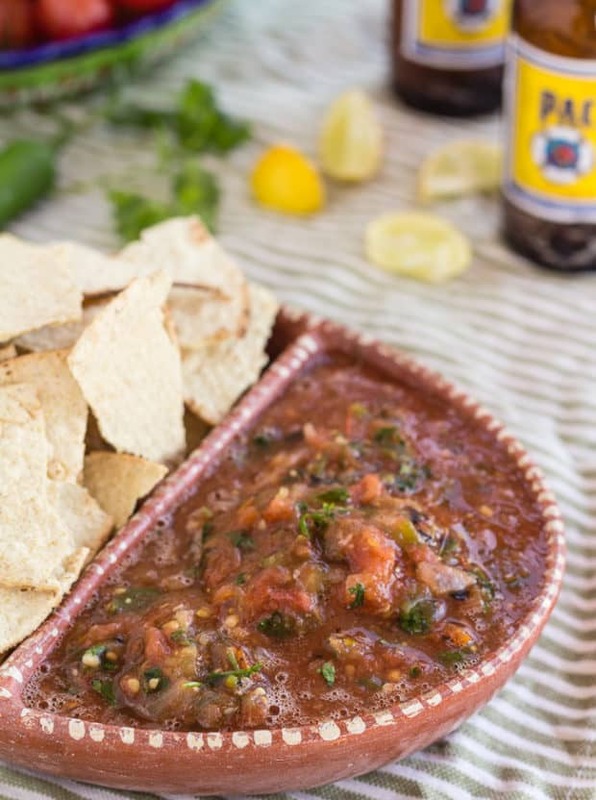 Though, to keep homemade salsa more than 2 days, cook it in a skillet just a few minutes, with a teaspoon of oil. It will taste more like bottled salsa, which includes citric acid as a preservative. ** This is an update of the Mexican tomato salsa recipe, migrated over from my no longer live muffintalk blog. The photo in the pretty blue dish is from that blog post.